When I was growing up, Christmas and Christmas decor was always a bit of a big deal in my house. There are things that only came out at Christmas time that while now long gone, still stick clearly in the noggin. From my mother's winter window ledge display (handmade by her) to our homemade salt dough ornaments (now lone gone) these iconic holiday goodies are what makes Christmas Christmas. Sadly, most of these treasures have been lost (along with my dear, quirky, mother) but a few are still around and today I am going to show you a redo of a Christmas Wall Hanging my sister made back in the 1960s, when she was six years old. For this version, you'll need to scrounge around for some items you may already have and pick up a small piece of burlap to begin, are ya ready? Grab your cardboard and cut it down to a manageable size. The original tree is about 10"X12", I repurposed a stuffing mix box (from Turkey Day) and simply cut out the front, it measures about 8"X10". Cut your burlap down to size about 2"-3" larger all around than your cardboard. 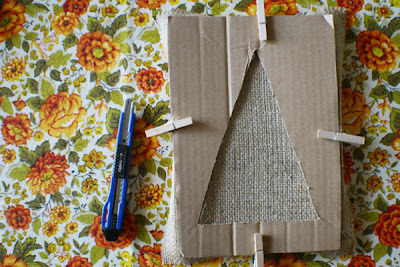 Smother your cardboard with glue (the blank side) and center your burlap over it. Place a sheet of wax paper on top and a stack of books to weigh it all down and set is aside to dry. 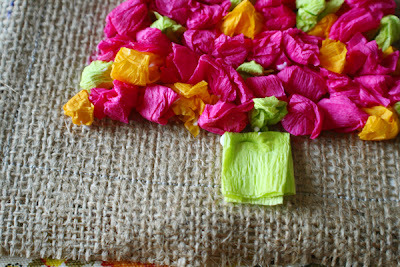 Once the burlap is dry, give it a whirl through the sewing machine, going around all four sides using a running stitch. I ended up doing this after the tissue tree was finished which is fine but you may wish to get a go on it first. 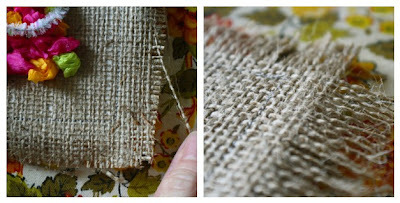 You do not need to be it will help keep the burlap in place and give it a little extra incentive to not unravel too much. While the glue is drying, have your kiddos select up to three (harmonious) colors of crepe paper or streamers. 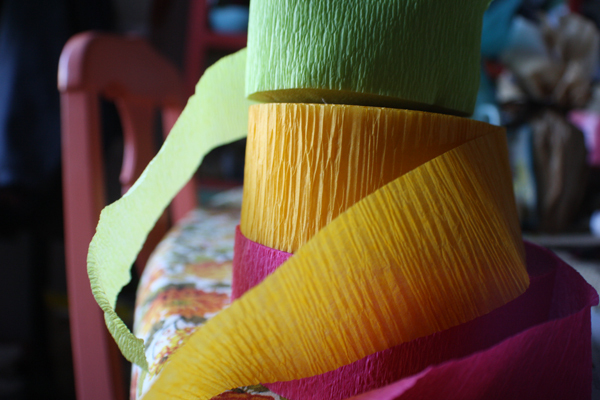 Streamers are great for crafting as they are inexpensive and have multiple uses. My sister's tree used three shades of green. My redo involved a bit of a modern twist on colors. Keep the palette simple which is why I suggest limiting it to three colors. 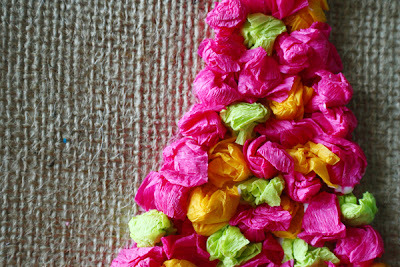 Once they have their colors selected, hand them some scissors and let them cut of squares of streamer into a shallow dish. Set aside. 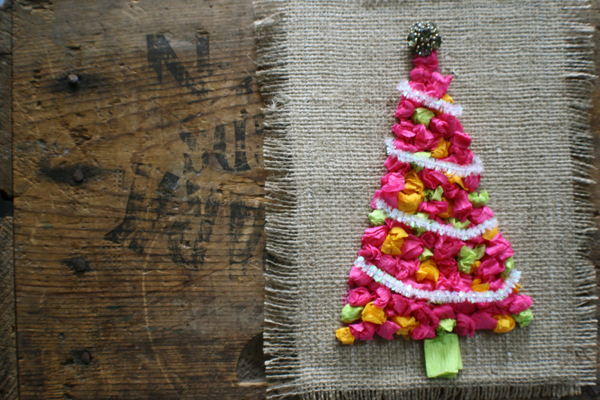 While your kiddo is cutting up crepe paper, grab the other side of the box you repurposed (or any piece of cardboard) and cut out a triangle shape for your tree. This is where the straight edge comes in. This part is for grown-ups ONLY. 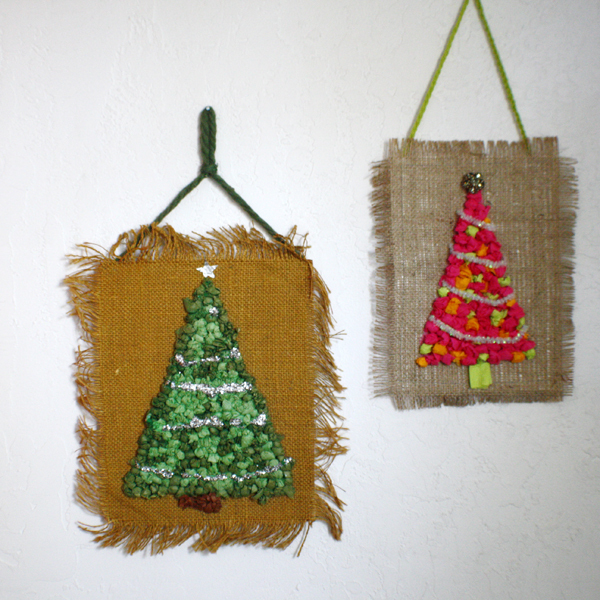 When the glue is dry on your cardboard, clip your tree stencil to the front using paper clips or clothes pins. Pour a small amount of glue onto a lid or other small flat dish or tray and have your kiddo grab a square of tissue and crumple it into a ball. Dab the tissue ball into the glue then place onto the edge of the triangle/tree. Continue until the tree is outlined. They may wish to use all one color or randomly mix it up, either way is fine, it is their tree. Once the outline of the tree is finished, they may continue adding tissue balls until the entire tree is finished. Refill glue as needed. To create the trunk, fold one square in half twice to make a smaller squarish shape. Once the tissue tree has been completed, give your button/earring/pin a healthy does of tacky glue and glue to the top for the tree's star. Next, grab your sparkly pipe cleaner and cut into four pieces varying the lengths. 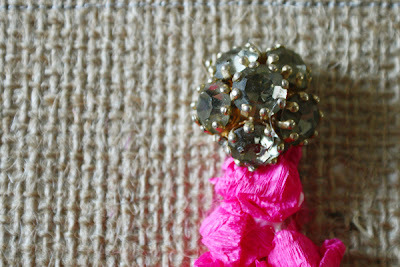 This will become your tinsel. Bend and shape if you wish and give each piece a good dose of glue before pressing down. Set aside to dry. 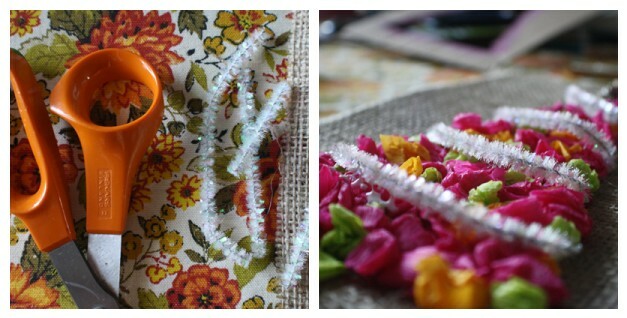 Pipe cleaners and glue can be tricky as the pipe cleaner takes a while to warm up to the glue. 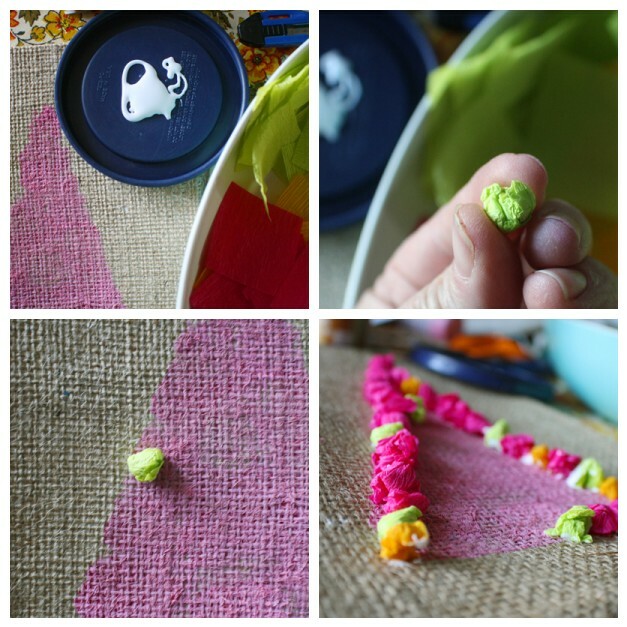 Make sure your kiddo has something else to do next so that they do not fiddle with the pipe cleaner pieces. Once everything is dry, use a large pin or needle to gently tug away the extra strands of burlap from the edges. They should unravel fairly easily. Your kiddo will probably like this part. Lookie at the happy fringe! 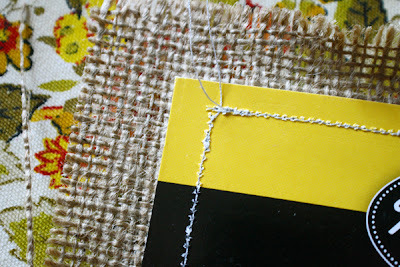 Use scissors to trim if you need to. Flip the whole thing over and tape a length of yarn to the back (one legnth of tape at each end of the yarn). I braided up my yarn, you do not have to. 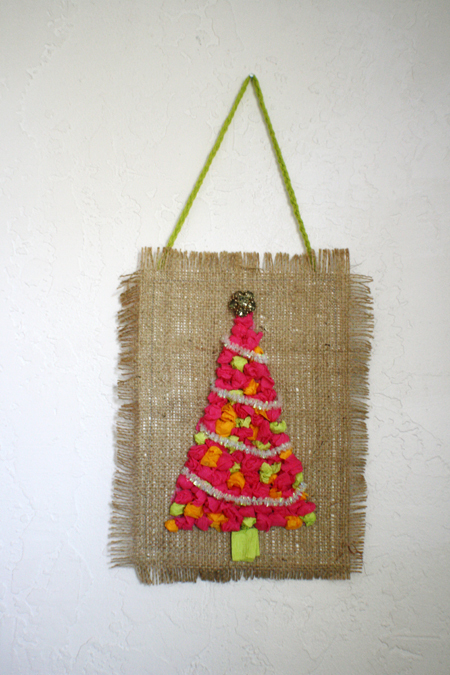 You can also use ribbon or twine. If you like, glue a happy paper backing to your board first so that you are not greeted with a product picture (I kinda like the product picture, it will give you a retro feel in about twenty -years or so). Have your kiddo sign and date the back as well. Find a happy place to hang and admire. Now go bake some Christmas cookies! 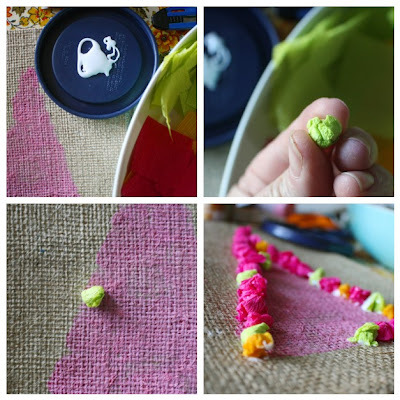 This project uses up all sorts of nifty developmental elements for your kiddo; scissor cutting, measuring, practicing the up and down of the sponge painting, small/fine motor skills during the balling and glueing, patterning and color fun in selecting their colors and shape recognition using "circles" in the triangle. This is a less than open-ended project but has its bits of usefulness in preparing your kiddo for following instructions, planning their vision within a set of instructions and using up all those nifty skills they are developing. I hope you enjoy this project and if you do make a tissue tree, please add it to the flickr group and/or email me an image and link and I'll add you to the 'do! Happy crafting! I adore the colors! I adore your creativity!!! Just wondering if the thin "tissue" wrapping paper would work? Thanks- love this and Im making these with my girls this weekend. Love the natural look/ vintage look. The burlap medium really adds a nice touch to this craft. Hi Jennifer, sure! I think you could do this with any kind of thin paper. Enjoy! This is a great idea- beautiful.